As a pug owner, you're likely familiar with the issues a brachycephalic dog faces: sensitivity to heat, potential breathing challenges and vulnerability to eye injury. Birth is also an ordeal for pugs because the puppies larger heads and shoulders can cause delivery problems. 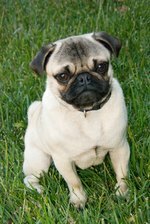 If your pug is pregnant, your vet should determine if a cesarean section is necessary. If you get the go-ahead for a home birth, be prepared to be present and ready to help, if necessary. Checking for blood sugar irregularities. If the vet determines your pug can deliver her puppies without a cesarean section, your job is to prepare her a birthing spot and understand the signs that she, or her puppies, need a helping hand. Drop in rectal temperature to below 100 degrees Fahrenheit. When all goes well in the birthing process, a puppy comes out head-first, enclosed in an amniotic sac. The sac usually tears during delivery, however if it's not broken, the mother usually tears it open. Normally, a mother will vigorously lick her puppies, removing any remnants of the birth sac and mucus from the puppy's mouth and stimulating him to breathe. It's common for the mother to chew the umbilical cord, eating the placenta and afterbirth. If the puppies are crying or whimpering within a minute or two of delivery, that's a good sign that everything's normal. Your pug may not be tending to the normal post-delivery duties. If she does not chew through the umbilical cord, you should use sterilized thread to tie it tightly around the cord, pulling the ends quickly to cut the cord. Another option is to wipe scissors with alcohol and cut the umbilical cord on the mother's side after tying it with thread about an inch from the puppy's body. Occasionally, a dog may not remove the amniotic sac; you'll need to gently open the sac using your fingers. Use the suction bulb or your finger to remove mucus from the puppy's mouth. Carefully wipe the puppy with clean towels and put him in the whelping box with his mother. If a puppy is being born tail and hind legs first, or breech, contact your vet because your dog may need professional help or a cesarean section. Delivery doesn't start within 24 hours of a decrease in temperature below 99 to 100 degrees Fahrenheit. The first puppy hasn't been delivered within three hours of the beginning of active labor. Subsequent puppies are not delivered within two hours of active labor. A puppy does not appear after 15 minutes of consistent straining. Labor appears to be over, yet the expected number of puppies haven't been delivered. A puppy protrudes from the birth canal for more than several minutes, despite constant straining. Dystocia is a veterinary emergency requiring immediate assistance.